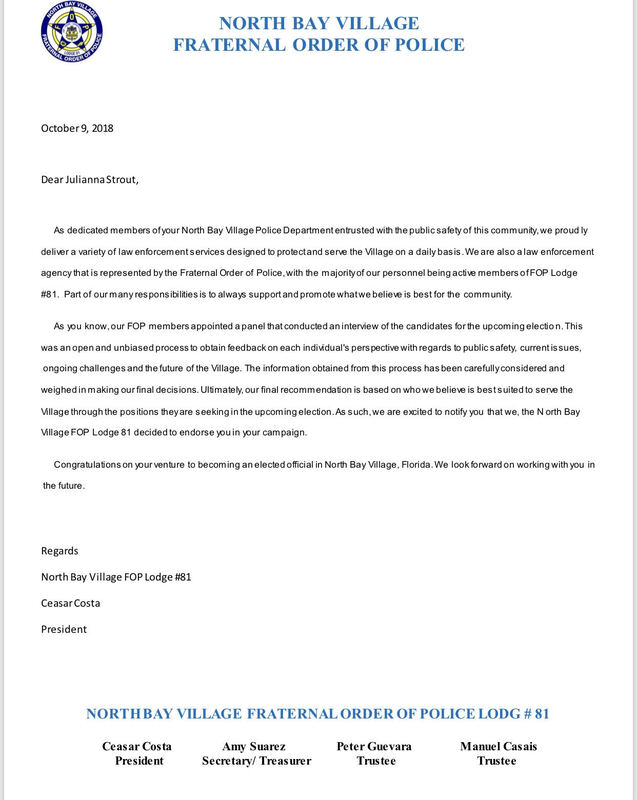 The North Bay Village Police Union, the Fraternal Order of Police, have endorsed Brent Latham for Mayor and Julianna Strout for Commissioner-At-Large. There are many reasons for this, mostly about how well Latham and Strout understood the issues facing the police in North Bay Village, and the fact that they have concrete plans to improve public safety, involve the police in the community and probably most importantly, to stabilize the command of the police department. The stability part is a huge issue. I have spoken with cops with decades of experience in the field and in North Bay Village and their biggest single concern is the revolving door of the police chief's position. After Carlos Noriega was fired, supposedly to take us in a "different direction", most of the progress he had brought to the department has been lying fallow. When Lewis Velken was brought in after John Buhrmaster declined the position, he faced a department still fighting over union battles, hurt from the political chicanery of Commissioner Cattabriga resurrecting a dead scandal over the "hurricane party", a department halfway to full certification, and officers worried that the command direction would change yet again with the political winds. Velken did not have time to stamp his command style on the department as he was quickly reassigned to be Interim Village Manager and once again, the department entered what seems like an eternal holding pattern. Velken was originally posted as a "dual appointment" but the Village Attorney needed to be educated on the fact that such appointments are illegal in Florida and I'm certain that he has not been de facto violating that. Things like certification matter. It matters to the young cops who may want to move to another department to come from a certified department. 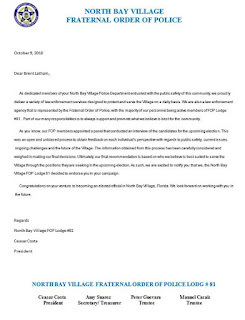 It matters to the Village because our PD is eligible for grants and sharing resources. It matters to the citizens because we know that the PD is up to date and in conformance with best practices. Certification was just one of the programs dropped, then outsourced to start over again. The K9 Unit has been disbanded. The PAL camp was under threat until the residents made it plain that it matters to us. There continues to be talk about eliminating local dispatch. The PD bought GPS equipment but never implemented it. One issue on the table is 12 hour shifts for our police. This is billed as a cost saving measure and it might be, but it is deeply unpopular with the cops whose lives would be disrupted by this. It's the sort of thing that looks good on paper but only a manager with no experience of our police would think was a good idea. It looks leaderless over there and the cops are tired of it. And let's face it. I think the cops were tired of being insulted by Laura Cattabriga. The hurricane party was an idiotic frat boy stunt that had been dealt with by Chief Noriega. Cattabriga dug up the corpse and paraded it on television claiming to be "terribly concerned" about it and wanting to know more. What more she needed to know was never made plain. 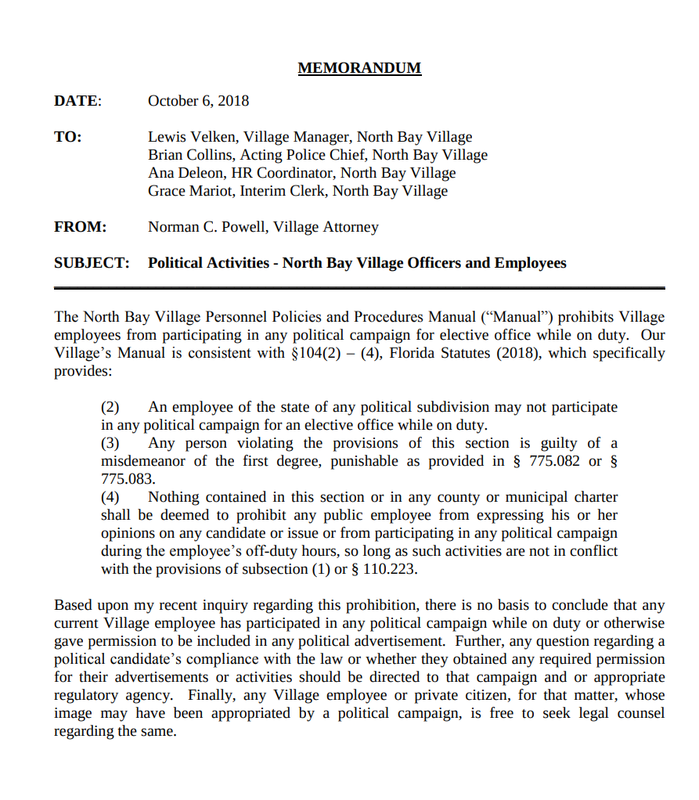 During the same time that Cattabriga was saying she was concerned about the "disturbing behavior" of the Village Clerk because she was incidentally filmed in a campaign video diary and justifying a payout to the same Clerk to avoid a lawsuit, Cattabriga also prepared and mailed a campaign flier featuring two North Bay Police Officers in full uniform, something prohibited by Village law. 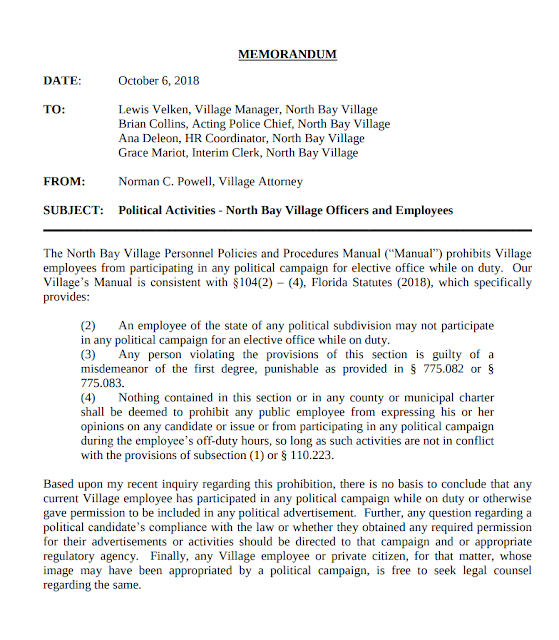 There's a question of whether or not they gave their permission, although based on this memo by Village Attorney Norman C. Powell, it does not look like they did. The police department itself has not issued a statement on the matter nor have the officers spoken publicly. Powell exonerates Cattabriga while admitting that the police did not give permission. It seems like the Police Department are just props to Cattabriga's ambition. It's not the first time she abused her position and it won't be the last. But it does feel pretty creepy that Cattabriga used two unwitting cops and a group of kids in her campaign without their permission and without the permission of the kids' parents.